So. Today is Comic Relief day. 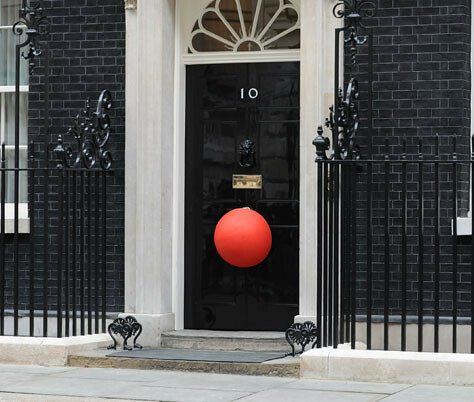 Have you got your Red Nose? Alas, I haven't because I've actually not seen them for sale anywhere... I fail, I know. Anyway, in the spirit of things and people doing something funny for money, here we go. Peter Serafinowicz is having a vegetable pop star competition. I don't know if this is being done anywhere other than on his Twitter, but you can find it here. Buddy Cauli with his hit "Veggie Sue"
I would play, but I can't think of anything worthy for this, so I'm passing it on to you guys! That looks awesome on the door! I think Comic Relief is a British thing... but I can't be sure that it hasn't ventured elsewhere now. It's a two yearly phenomenon and I normally go out and buy a red nose, for RND, but I've not been out much this week, and where I've been hasn't sold them! Maybe I'll have to see if there are any left next week, just so I can feel I've done something for it all. We have it here in Germany too, at leats during the last years. Dunno, maybe its on another date here. Have alink: http://hessmo.com/Hessmo/TG_Specials.html The guys trying to redo someones garden - Top Gear style of course. Chaos ensues. Je ne sais pas. This is the 21st year of RND. That's got to be impressive then cause they do lots of hilarious things!